About 30 people and a number of news organizations showed up at the protest site before 8 am this morning. RCMP Inspector McGeough and Corporal Gopp arrived with coffee and muffins. SRD was late. We told Inspector McGeough that we were appealing both the Enforcement Order and the Court Order that told us to leave the protest site. The Inspector indicated that, regardless, he would be enforcing the Court Order. Shortly after 8:00 we communicated this to all those assembled at the site. Most people left to reassemble down the road by the Castle Special Management Area boundary to continue protesting there. Three people decided not to leave and were arrested. They were held in cells for at least a couple of hours before being released by Pincher Creek RCMP. A fourth person returned to the site some time later and laid down in front of the logging equipment. He was also arrested, and later released. Given the uncertainty surrounding the appeal of both the Enforcement Order and the Court Order, we asked SRD to instruct SLS to stand down and not to begin any logging until the appeals are heard. Unfortunately, Spray Lake Sawmills began cutting trees and presumably building an access road. Our appeal of the Court Order will be heard on Friday at about 10 am at Chambers in the Calgary Court Centre. 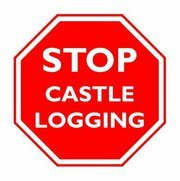 We will continue to fight this logging in the courts. This entry was posted on Wednesday, February 1st, 2012 at 12:18 pm and is filed under Uncategorized. You can follow any responses to this entry through the RSS 2.0 feed. You can leave a response, or trackback from your own site. Is it possible to maintain postings on this site (e.g. rallies etc.) ? I’m fielding interest and am directing people to it.